Home. Biography. Media. Street Team. Pre-Orders. STORM CORROSION is the long-discussed and highly anticipated collaboration between two of the current music scene's most innovative and multi-talented artists; Porcupine Tree's Steven Wilson and Mikael Åkerfeldt of Opeth. The pair have been friends since the early '00s, when Wilson co-produced Opeth's revered 'Blackwater Park' album. Over the years, they'd often spoken of working on a project together, but it wasn't until recently that they managed to make something happen, when Mikael flew over to visit Steve in the UK and they ended up in Wilson's home studio throwing ideas around. That visit was the nascence of a whole self-titled album, written and produced by the pair and mixed by Wilson. 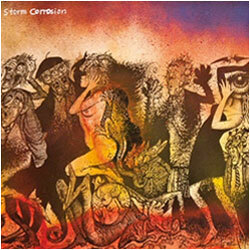 The sound of STORM CORROSION can best be described as enchanting, orchestral, ambient, epic (half the album's tracks clock in around the 10 minute mark) and nothing short of surprising to the new ear. However, the musicians' respective fanbases will be primed to appreciate the new output, with Wilson's recent solo album, 'Grace For Drowning' and Opeth's 'Heritage' having brought them to a logical place to understand STORM CORROSION. This eponymous collection is almost viewed as one side of a musical triangle. In stores 7 May. Click here for pre-order options. © 2016 Storm Corrosion. All rights reserved.